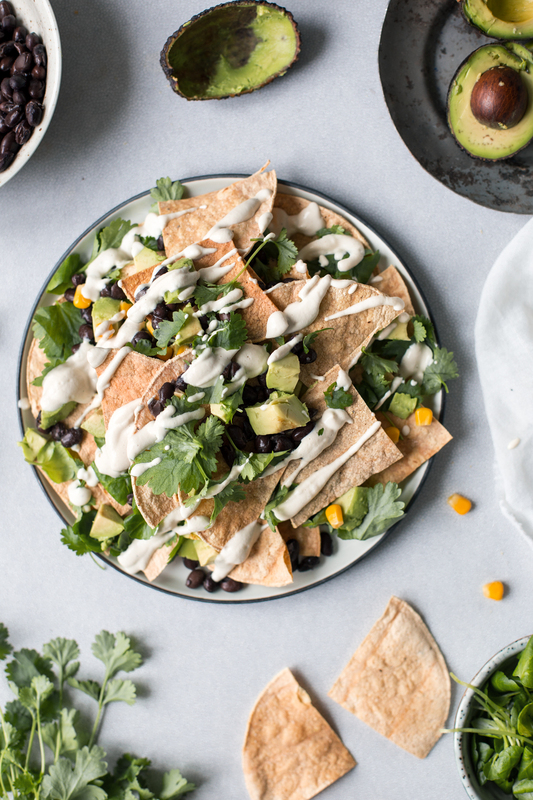 Healthy Vegan Nachos + Pre-order gift: GATHER e-book! Oh boy, do I have a bunch of good news for you today! There’s a whole lot of ice cream goodness + other fabulous news + healthy vegan nachos, so sit back, take a minute, and check it all out! First of all, our book N’Ice Cream is now available for pre-order! Woohoo! That means that there’s only weeks until it comes out in the States on May 17th by Avery Publishing / Penguin. I am so excited, because this is the book of my wildest ice cream dreams, and I think it will be a dream come true for you too. There are more than 80 (!) recipes for healthy homemade vegan ice creams in the book. That’s right, all the recipes are plant-based and free from dairy, gluten and refined sugar. No weird stuff, just good-quality, natural ingredients that make you feel good inside and out. There are recipes for Creamy Ice Creams, Ice Pops & Sorbets, Instant Ice Creams, Milkshakes, and Ice Cream Cakes and Cookies. And the best thing: each and every one of the recipes can be made without an ice cream maker. So to make sure you’ll have the chance to treat yourself with these goodies as soon as the book hits the stores, pre-order one now! Read more about the book and pre-ordering from our website: www.nicecreambook.com! And you know what’s cool about pre-ordering the book _right now_? The fact that you’ll get a fabulous gift as a thank you for doing that. As a thank you for pre-ordering, we wanted to give you guys something special. So we came up with this little surprise. And not just any surprise, but a whole fricking *FREE* 40-page e-book filled with delicious summer party recipes. 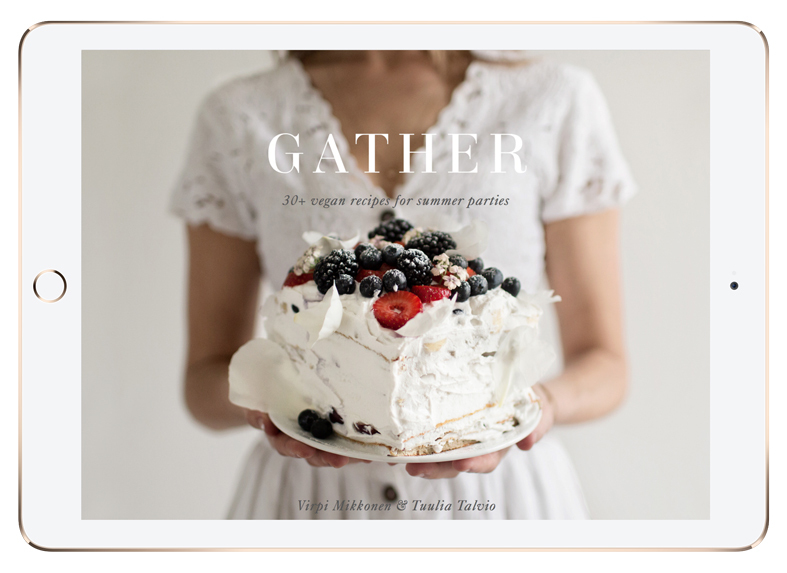 The e-book is called GATHER and it offers more than thirty easy-to-make, healthy recipes for your upcoming summer parties and get-togethers. All the recipes in the e-book are vegan and free from dairy, gluten and refined sugar. The recipes are exclusive for this e-book, and they’re all new ones! We’re really happy how it turned out and I can’t wait for the warm weather to arrive here, so that I can invite my friends to a picnic and make a bunch of these goodies! – 30+ healthy, easy-to-make recipes for your summer parties & get-togethers. – Exclusive and original recipes, that are not available elsewhere. 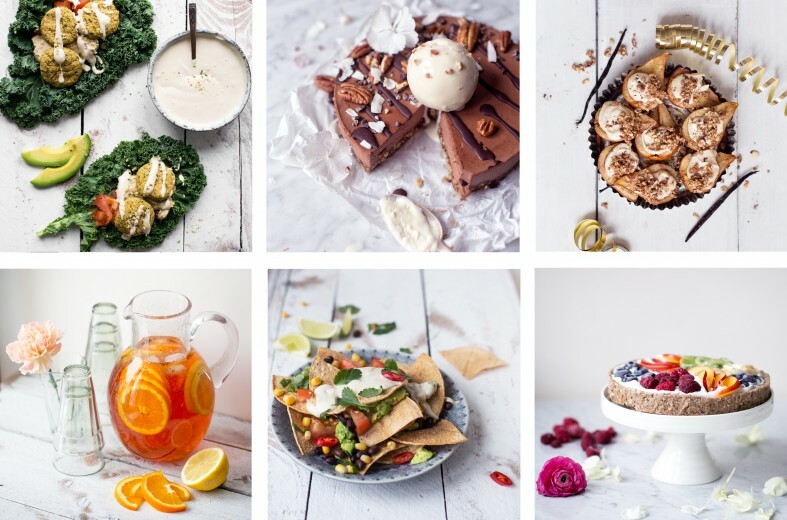 – All recipes are free from gluten, dairy & refined sugar, and they’re vegan too! – Recipes for savory snacks, sweet desserts and fresh drinks. 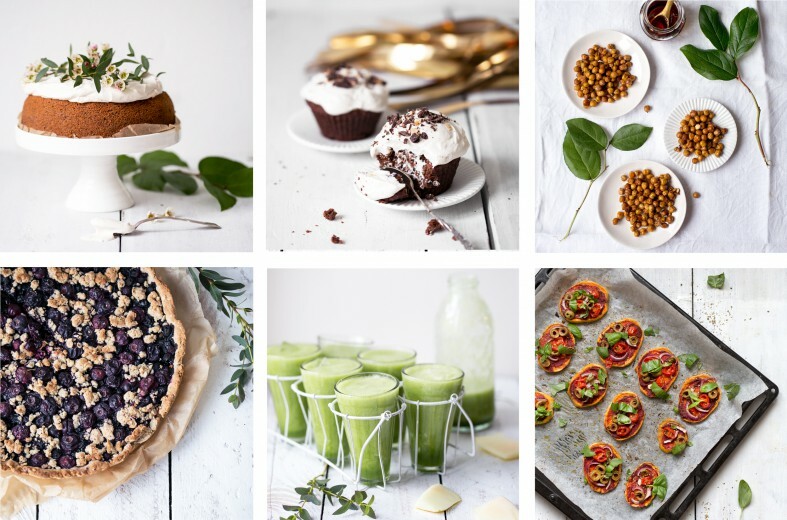 – A photo for each recipe. – Tips for organizing a stress-free party. I’d say it’s the perfect companion for your N’Ice Cream Book this summer! To get the e-book, all you need to do is to pre-order the N’Ice Cream book, save your order number, send it to us and you’ll get the GATHER e-book straight to your email. Cool, right? And if you’ve already pre-order the book (thank you! ), you’ll get the gift too. Read more about the GATHER e-book and get yours HERE! Please note that the gift e-book comes only with the N’Ice Cream book, and not with the Finnish version Hyvän olon jäätelökirja, which will be out in just a few weeks! Make sure you sign up for my newsletter, as we’ve got bonus recipes, giveaways, playlists and other cool stuff in the making. There’s some seriously delicious stuff coming up! Our book is on Instagram! Come and follow @nicecreambook to get lots of ice cream inspiration, bonus recipes + other gorgeous goodies! – Pre-order N’Ice Cream book and get a free gift! – Download and save the e-book to your laptop, tablet or phone and enjoy the recipes! – Sign-up for my newsletter to get extra recipes, cool bonus material and all kinds of fun. – Follow @nicecreambook on Instagram to get sneak peeks of the upcoming book! Before sharing a recipe from the e-book (Healthy Nachos!! ), I just want to thank you for all the sweet words, likes, comments and support you have gave us with this book! It feel so great to hear that you’re as excited about this as we are and we’re ready to start a whole n’ice cream revolution! :) And if you feel like sharing this post with your friends, telling them about the e-book, the ice cream book, or anything else, we’d be so grateful! But now, let’s move on to the nachos. This is one of my favorite recipes form the e-book. Maybe because there are three things to be excited here: Homemade Tortilla Chips. Vegan Cashew Sour Cream. 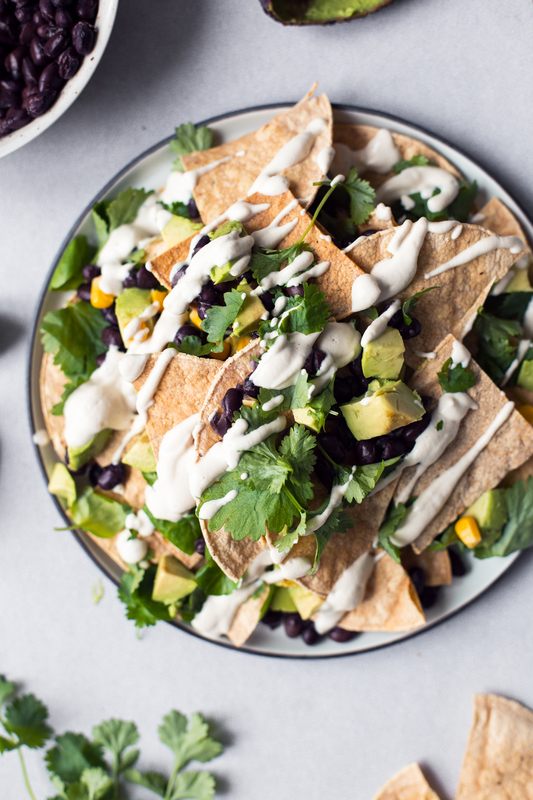 Healthy Vegan Nachos. Making your own chips might sound hard, but really, it’s not. At least with tortilla chips. I made these from store-bought gluten-free corn tortillas and baked them in the oven until crispy. So good and crunchy. If you’d like to be a true artisan, you can of course make the tortillas from scratch and then turn them into chips. 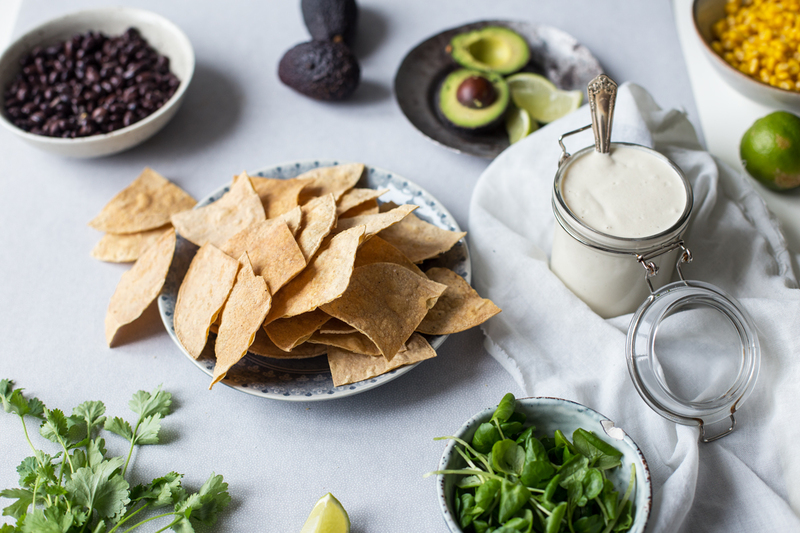 Or if you’d like to simple things down, you could just pick up organic tortilla chips from the store and focus on the creamy Vegan Cashew Sour Cream, that makes this whole thing so good. + cherry tomatoes, chili, etc. Prepare the tortilla chips and The Vegan Cashew Sour Cream first. Drain and rinse the black beans and corn. 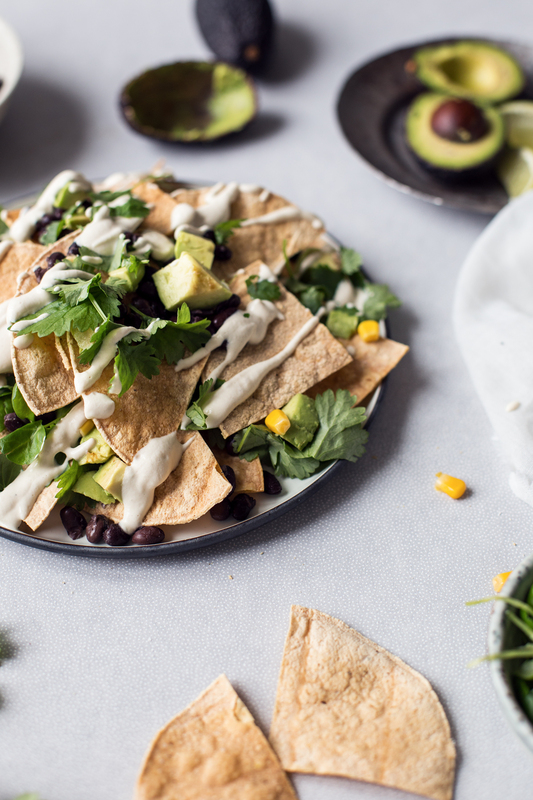 Cover a plate with tortilla chips, top with all the fillings, and finish with a generous spoonful of Cashew Sour Cream. Serve, and enjoy! Preheat the oven to 400°F. Line two baking sheets with parchment paper and set aside. Cut each tortilla into 4 pieces and spread the pieces evenly on the baking sheets. Using a pastry brush, brush the chips lightly with the olive oil. Sprinkle with sea salt. Bake for 8 to 10 minutes, until the chips are golden brown and crispy. Let cool. Soak the cashews in water for 4 hours. Rinse and drain. Add all the ingredients to a blender and blend on high until smooth. Add more water, if needed. Taste and add more seasonings, if desired. Serve immediately or store in an airtight glass jar in the fridge for up to 4 days. Pre-order the N’Ice Cream Book now and get a free e-book as a gift! Tagged dips, ebook, nachos, party food, snacks, vegan. Satisfy your inner chocolate monster with this three-layered Chocolate & Vanilla Hemp Smoothie that gets a nice kick from mashed berries. To celebrate spring, make a delicious gluten-free Asparagus & Goat Cheese Galette!